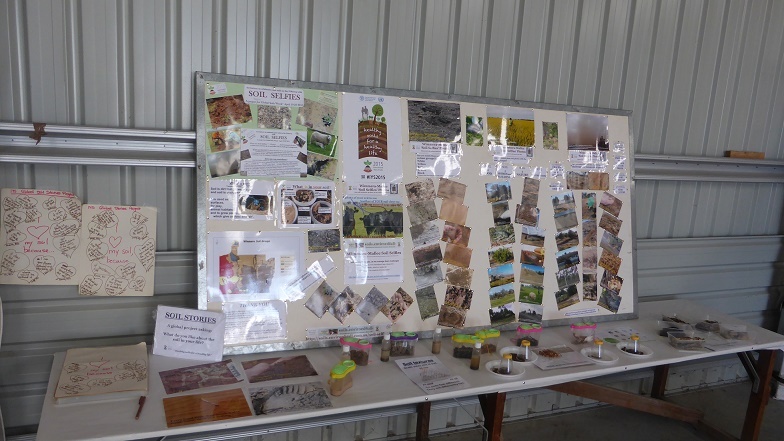 Wimmera -Mallee Soil Selfies photos, Snooping into Soils activities and Soil Stories Survey at the129th Warracknabeal Annual Show on Thursday 8 October 2015. What an enjoyable afternoon I had helping raise awareness of soils in our lives for the IYS at the Warracknabeal Show. 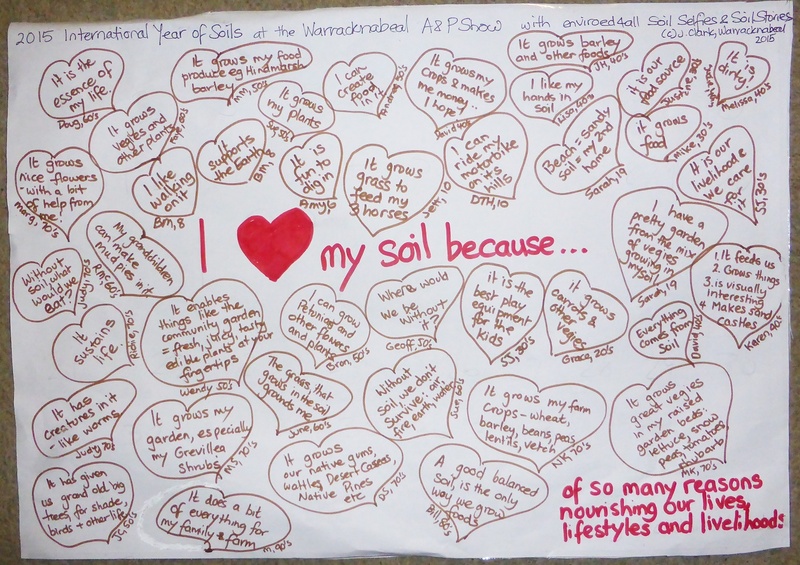 My thanks especially to the people who replied to the Soil Story survey question. The Wimmera-Mallee Soil Selfies photo display had about half from the local district. They were set up by soils up-close, in use and with challenges and managements. There were guidelines to find groups within these. – soil creatures under magnifying glasses – ok they were a bit slow in the heat that day! – four soil colour close-ups from other areas. 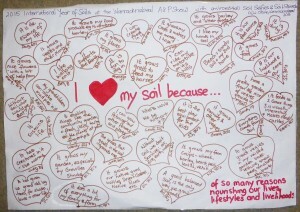 – and the growing replies for the Soil Story Survey “Why do you like your soil?”. Even those who thought at first that they didn’t know why they liked soil, were quickly able to realise what they use it for and so reply to the survey. Click on the diagram of replies to see the replies. I have loosely grouped them by age, but in doing so I noticed some themes coming through the 35 responses. They could be grouped by soil supporting life, lifestyles and livelihoods. Or they could be grouped by soil at the base of Nature, our activities and producing food (as we are a grain farming region). This could be compared with the responses from the children at Tempy PS answering the same question.